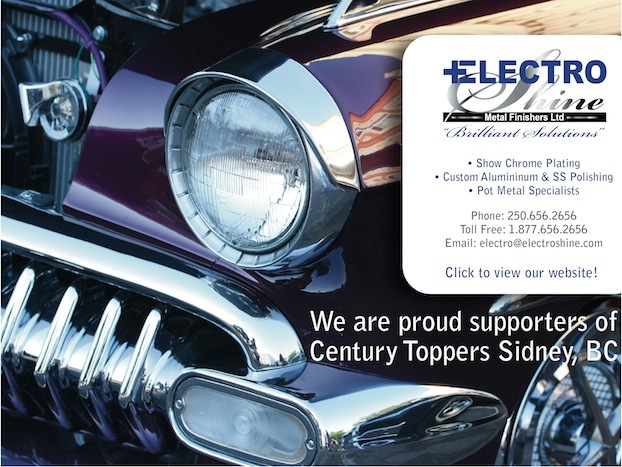 The Century Toppers Rod & Custom Car Club is a premier Victoria B.C. organization dedicated to the preservation, restoration, and promotion of the specialty car hobby. Our mandate is to maintain and enhance these rolling pieces of automotive art, creating individual expressions of beauty, and at the same time, encouraging a great social atmosphere for couples and families to enjoy the old car hobby and each other. Guests are welcome at any monthly meeting. All individuals interested in the old car hobby are welcome – specialty car ownership is not a pre-requisite. Meeting location: The Victorian at McKenzie Retirement Residence, 4000 Douglas Street in Saanich, the 3rd Wednesday of each month at 7:30 p.m.